Of a life much less their own. 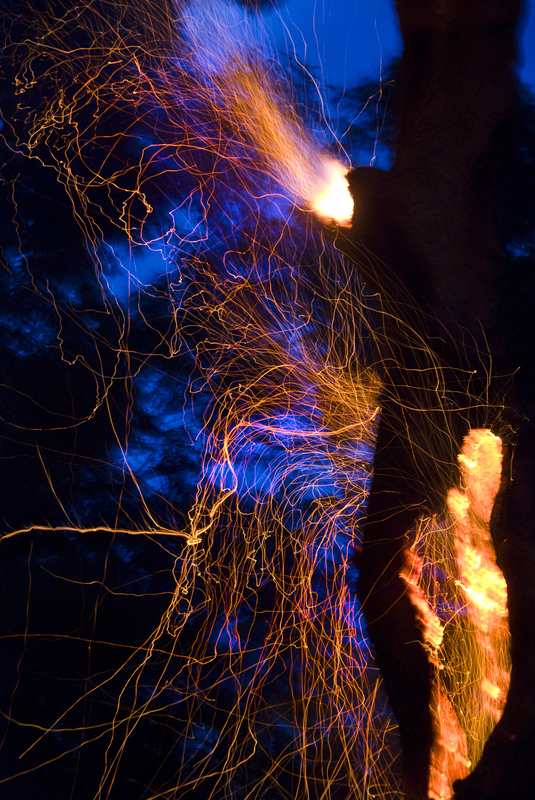 A hot and moving shine. The depths of their creation. Of heart and mind and eye. Every time I set foot outside my home, no, probably every time I open my eyes or my mind, a story awaits me. It seems my life is one of constant stories, layers upon layers settling in across time, and always, all ways, bleeding through to this present moment. Everything I see evokes stories for me or tells me yet another one to add to the journal of my existence. I thought I would try to share one story per week, with the images that inspired the memories or the inner dialogue or the secret whispers from beyond. All of these things will be within a short journey from my home… a day “trip” if you will….. I stood on the hill and felt the sky overwhelm me. It truly did reach out and embrace the whole landscape, as if invisible hands were unfurling a blanket way up in the heavens – it felt as if any moment it would drift down slowly and settle over all I surveyed, painting all beneath with its patterns and ever-changing designs – that undeniable bold blue that is so much a part of Australian life. I stood on that hill feeling diminutive, and yet grateful for eyes to see. As I continued to walk, looking upwards, it became a “thylacine sky” showing the face of the swamp dog and his striped curves, a salute to the respect and dedication this family feels towards the most mysterious of our Aussie marsupials. At the top of the hill, behind my parents’ home is a protected patch of bush that every year offers the most fascinating array of wildflowers and orchids….. through this area weaves a beautiful little bushtrack, naturally cobbled with the coffee rock or coloured ironstone that is the foundation of these ranges, a track that holds so much life and colour in the present and yet so many stories and memories from the past. This is the path I take today. As I walk, I am reminded of a young wife, transported from the comparable comforts of England, where she had worked for noble families, and propelled into the most raw, unknown territory half way across the world, with her husband and soon to be born, baby daughter. 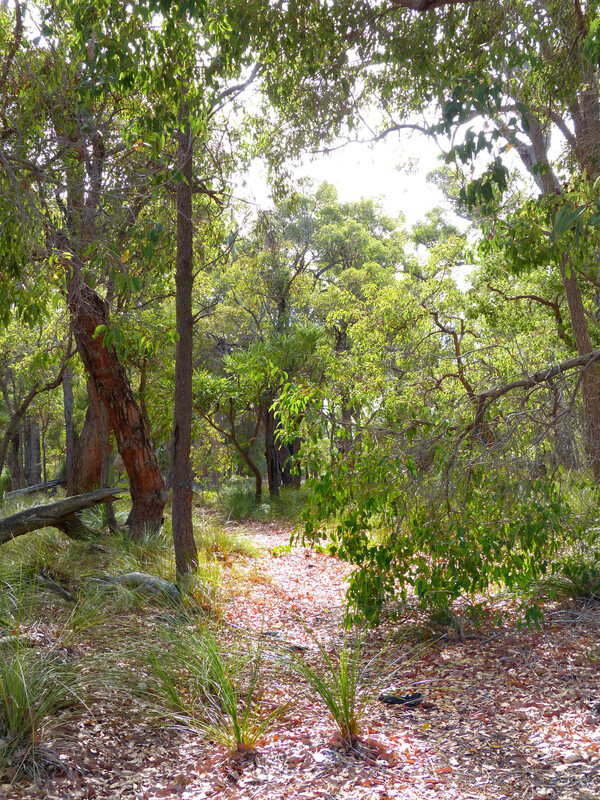 She walks this path and stands on this ground, the allocation given by the government of the day, and gazes around at the humble bush timber and hessian home – a simple one room “humpy” with dirt floors, completely at the mercy of elements so different to any she had known back in the “mother country”. 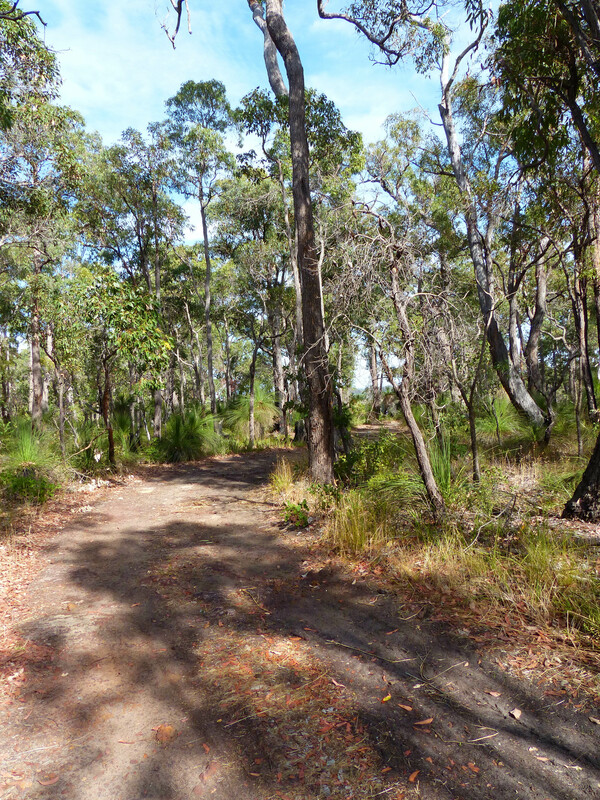 All around are the thick trees, many of which watch over me now, even as they did to this woman almost a century ago, all around are the unfamiliar sounds and smells of the bush, the melodic bird calls, intermingled with raucous screeching of cockatoos and other native birds; all around is the dense, amost suffocating bush with its ever present dangers and infinite secrets of the most ancient culture in the world. Here on this hilltop patch of white sand, in the midst of the many rocky outcrops, it would have looked very different than it does today. I felt the despair and the sweat, and the gritty discomfort of everyday living…. I felt the lure and warmth of neighbours and the sparse social occasions that seemed to be the very opposite of what she would have known in her previous life with family and gentry. The simple act of making a cup of billy tea for her husband, or damper scones, when he came in from milking their tiny but precious herd of cattle, would have seemed the only link with the past, but minus the silver trays and fine china. Perhaps some tea cups and lace doilies had travelled with her in her hope chests from England? But remembering my Grandmother as I knew her, in her little house in town sixty years later, those memories and rituals of life with gentry still remained, the tea service, the silverware polished and perfectly placed, the fine china cups and saucers and the every present manners and etiquette, the indomitable self-discipline, the work, the measured balance of all things. It was evident that the harsh environment that she had been uprooted into did little to erase her decorum and innate respectability or need for order. I wish I could have been a guest in her humble home back then. Though maybe I was….. in another life…. I pictured her walks along this track either on foot or or horseback, to visit with the nearest neighbours, my great grandparents, or on her way into town, to purchase stores and supplies from the sailing ships… or to attend services at the local place of worship. 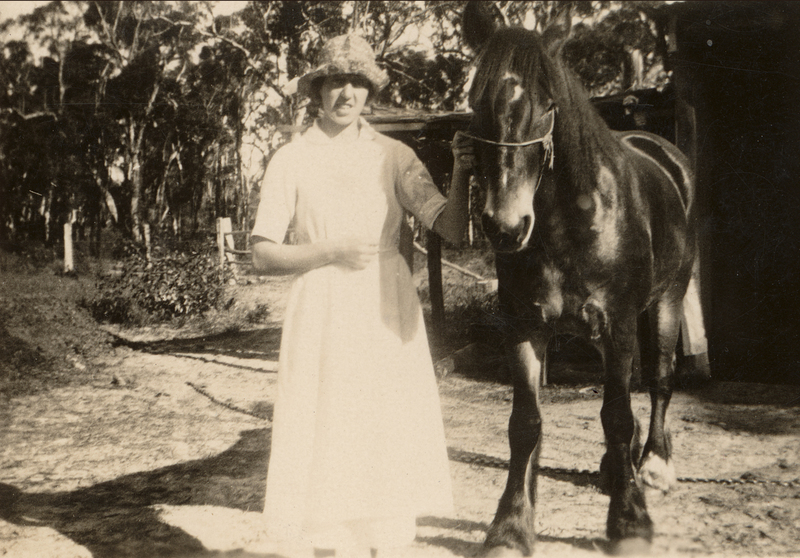 My Grandmother, age 26, with her horse near the bush track I still walk through today. Even as an older lady, the genteel white haired Grandmother we all visited, her favourite piece of advice to we of the younger generations was to “crack hardy”. We giggled and joked over that line, or even at times took offense because we had wanted sympathy or support and found very little in her scant dismissive words. There seemed so little empathy, so little recognition for what we might be suffering at the time, yet time has shown me she had only shared what she knew. When did she learn for herself that this was the only way to overcome life’s hardships and challenges, to bury the emotions beneath a tough exterior and soldier on? Was it during World War 1.when they brought news that her fiancé had been killed, leaving her to grieve without the man she loved and the future they had planned together? Was it her time working in the munitions factory and driving the trains there, setting her apart with that which was certainly not “womens work”. Was it when her fiance’s brother married her and brought her from her family and all that she knew to this rugged, inhospitable country to stand beside him and carve out a life for themselves and their new baby girl with little but their bare hands and inner strength? Was it the day she hurried along this track, distraught, carrying her little baby, with tears in her eyes and fear in her heart, seeking the neighbours on the farm down the track to help her, because her husband had not emerged from cleaning the small well near their house? I picture the devastation with which she would have stood this ground when his lifeless body was pulled from the well and the cold hard realization that she and her tiny daughter were now alone in this unforgiving landscape. Oh yes, this woman sure did know from an early age, what “crack hardy” meant and how her life revolved around that mantra. Today I walk this path again and think of my Grandmother. She would then have walked this path many times in the days following that tragedy, to find company and solace with her neighbours, my great grandparents – both Salvation Army officers. And perhaps the walk along this path eventually brought the promise of romance or at least companionship from their son, who she eventually married, joining their properties and their lives to lay the foundations of the family farm I know today. 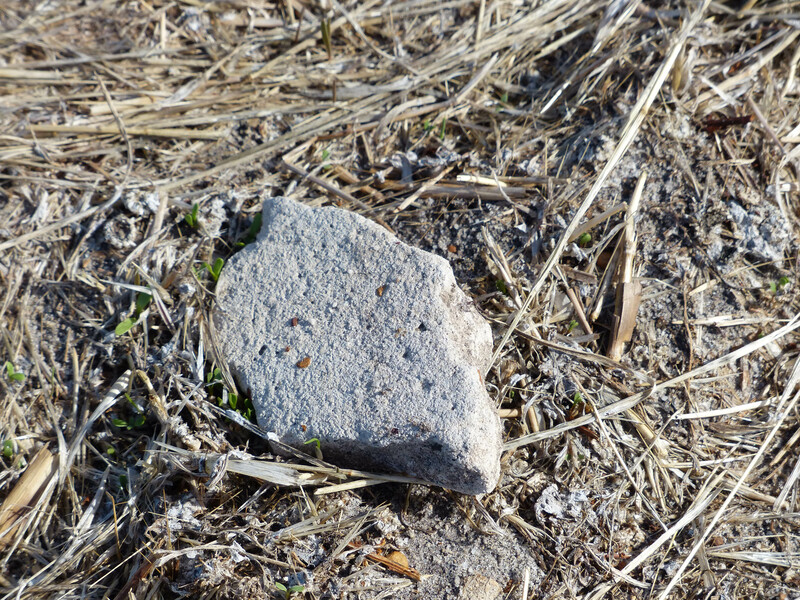 Now all that remains of their story are a few broken stones in a ploughed, cleared paddock, pieces of the foundations of the original dairy and other buildings…. and the pathway between the Ifound and Slee properties where my Grandmother walked, and the memories that linger along that stony track. 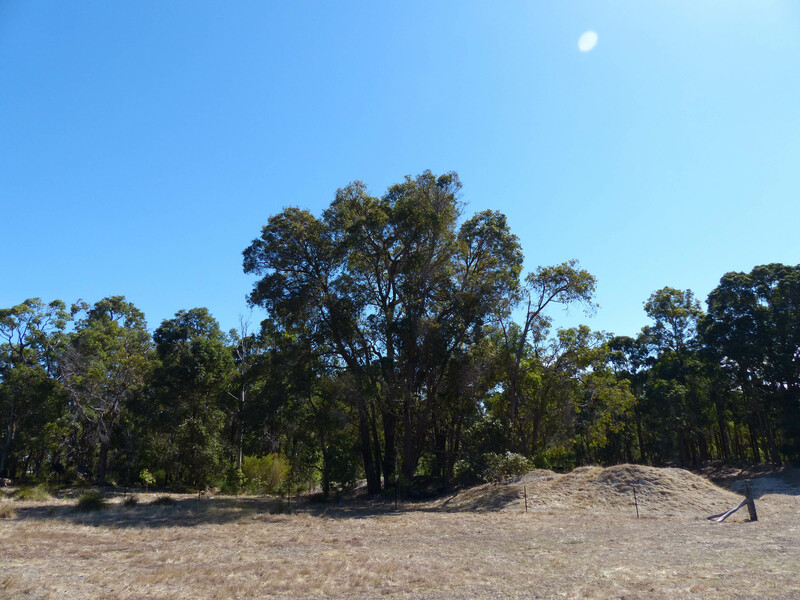 The site of their home and farm, and the well where her first husband died, is very close to the meeting place on the hill, the significant site where the energy of lives and families far older than my own still linger and whisper in the trees and in the air. I wonder at how disturbed the ancestors would have been to see the European farm unfold on their traditional communal grounds and whether their disturbance was manifested in any way towards the hardships felt by those first settlers. I hear my dark skinned sister whisper “It was odd to see people settle in one place to live, and try to stay still and survive throughout the seasons fixed to one location. It seems so inflexible and limiting. Moving with the seasons and the sky time is wiser in this land and enhances survival and quality of life”. Today, the ancient meeting place remains. 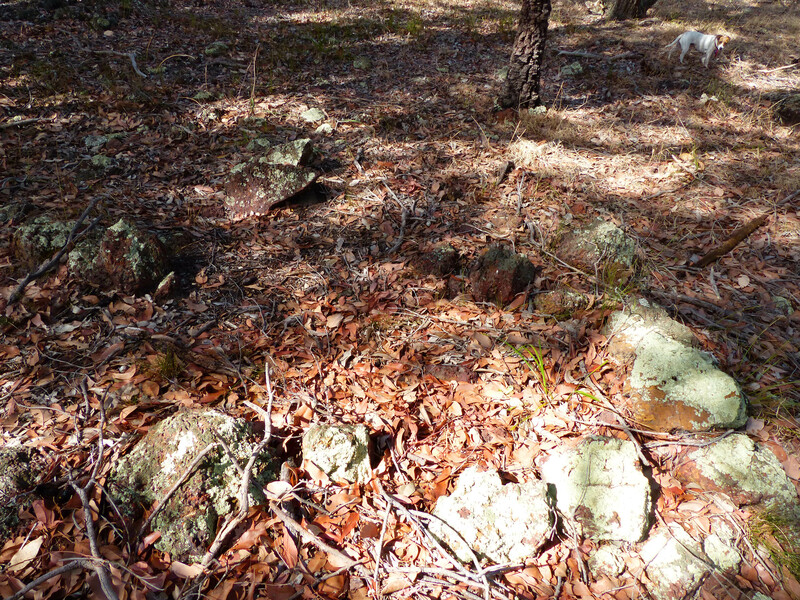 If you look hard, you might see circles of stones from ancient fires beneath the leaves and debris of the bush. 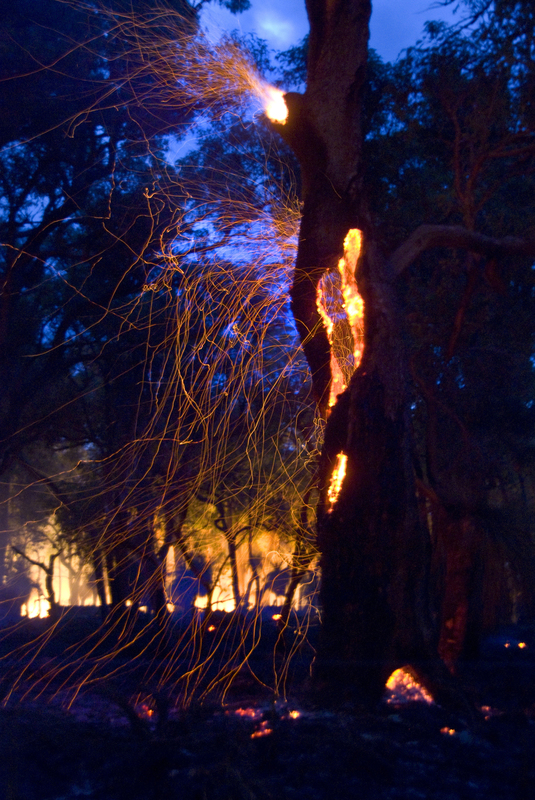 Are they ancient fire circles, often in clusters with a main one and smaller ones nearby? 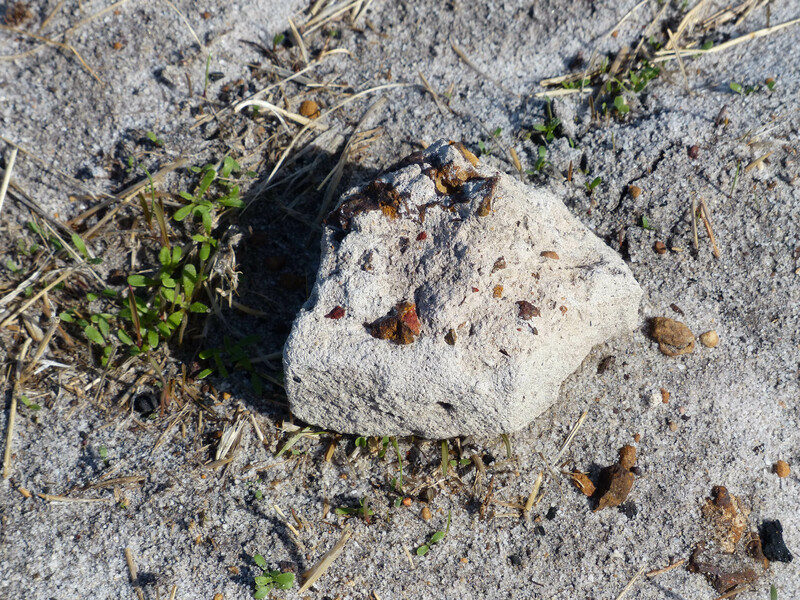 Or merely the circle of stones left long after an old tree has fallen and been burned or rotted back into the soil? I caution myself not to see something that is not there, but at the same time, the feeling that there is way more than I can ever see embedded in this landscape, is evident in every cell of my body. 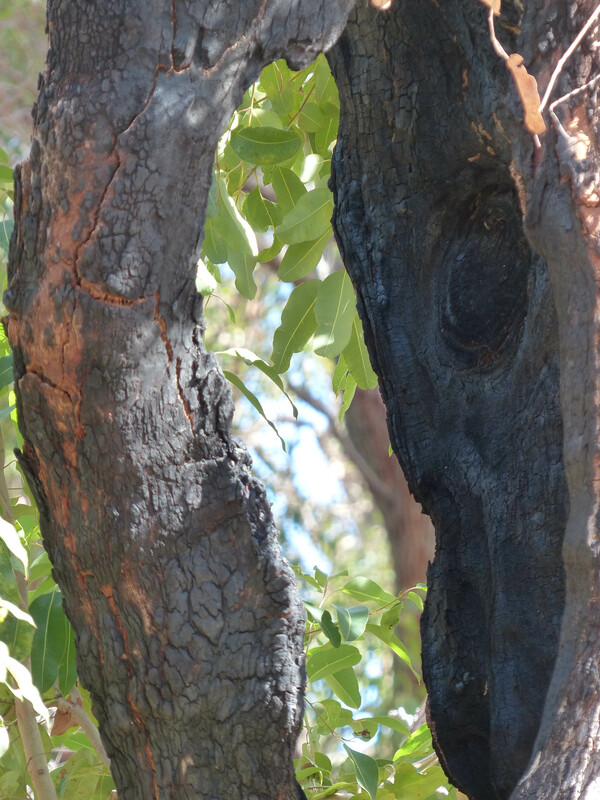 And are the marked trees actually “scar trees”? 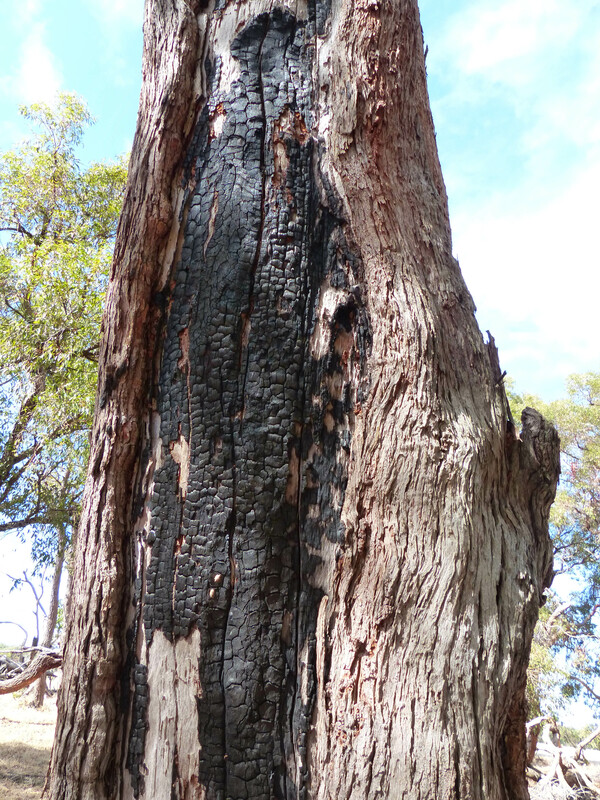 Century old jarrah trees bear the telltale cut marks that could indicate the work of hands of from hundreds of years ago. I stand beneath the trees and there at my feet is blood splattered on the leaves of the forest floor. 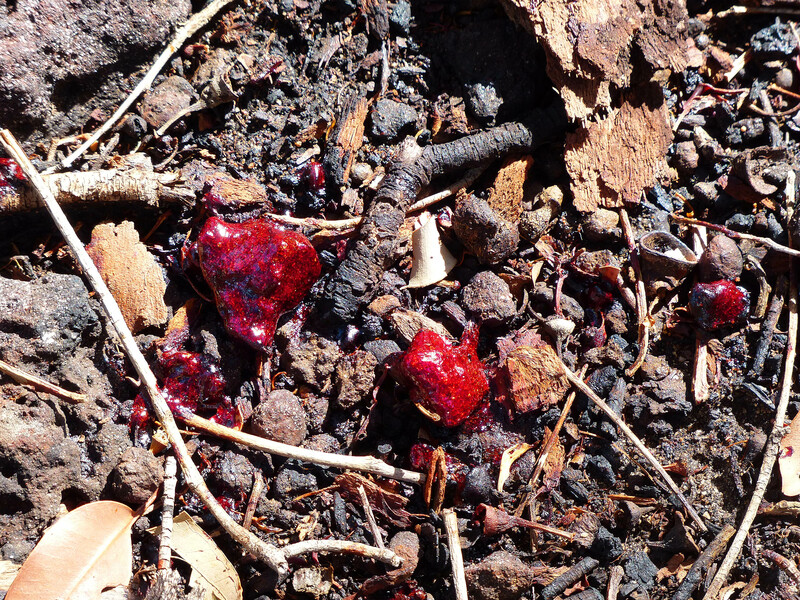 Bright red drops and formations paint a picture in the debris of the forest. 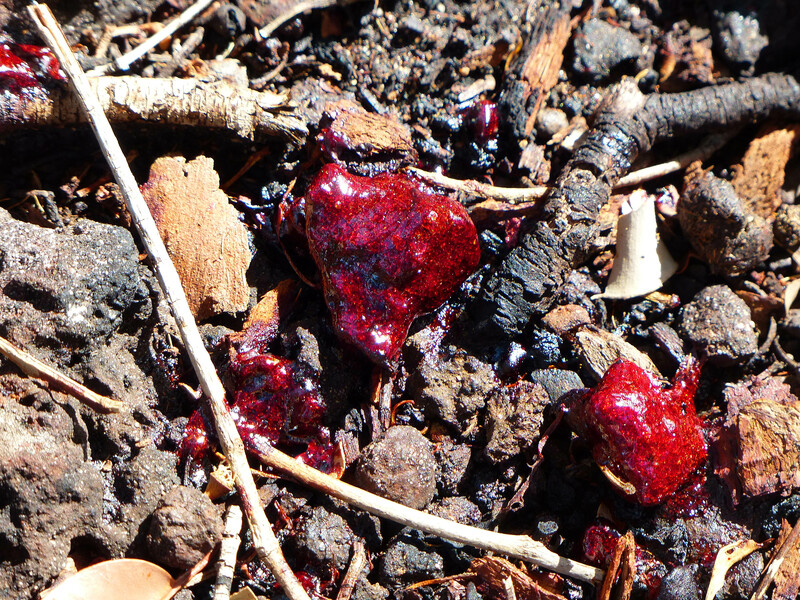 Who is it that bleeds their silent pain and the hardship of their existence into the ground? Who shares such sadness, evident for only those with eyes to see? 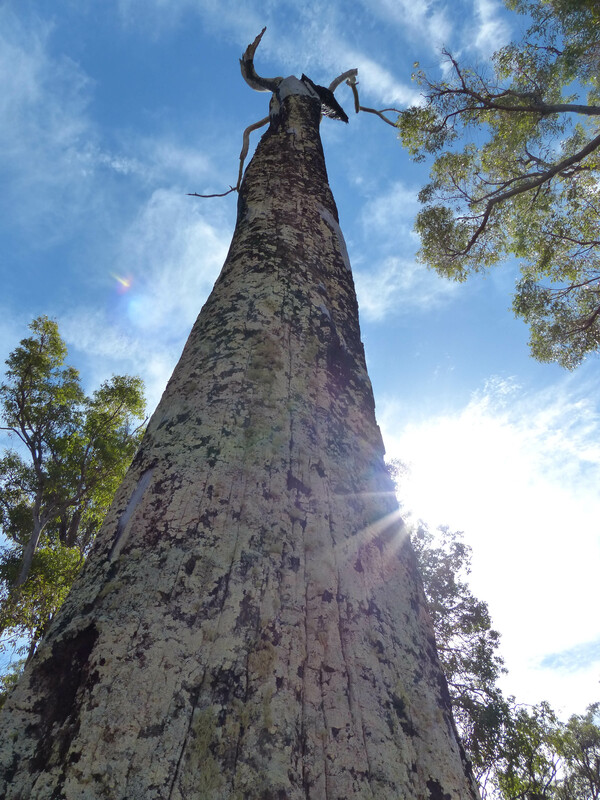 The ancient redgum towers above me and defies the adversity and interference of humanity, by displaying its life story against the sky. 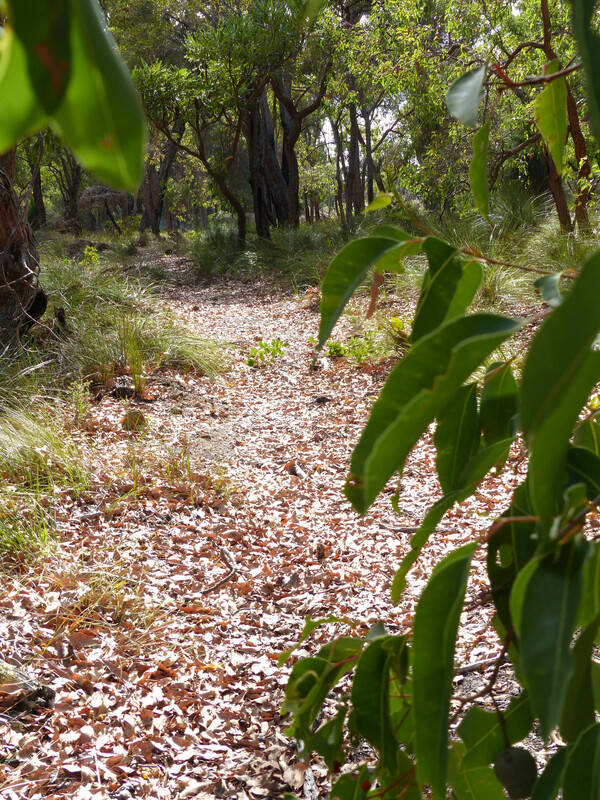 I walk on, following another overgrown track through the bush. It leads me to a waterhole, manmade with machines, but one which taps into the sacred underground water of the Yarragadee. This area abounds with places where the water rises to the surface or emerges from the earth and flows from the Whicher Ranges towards the ocean in Geographe Bay. At first glance, it is like a window in the baked end of summer ground, a giant hole full of trees and sky that reach downwards into the Earth infinitely. 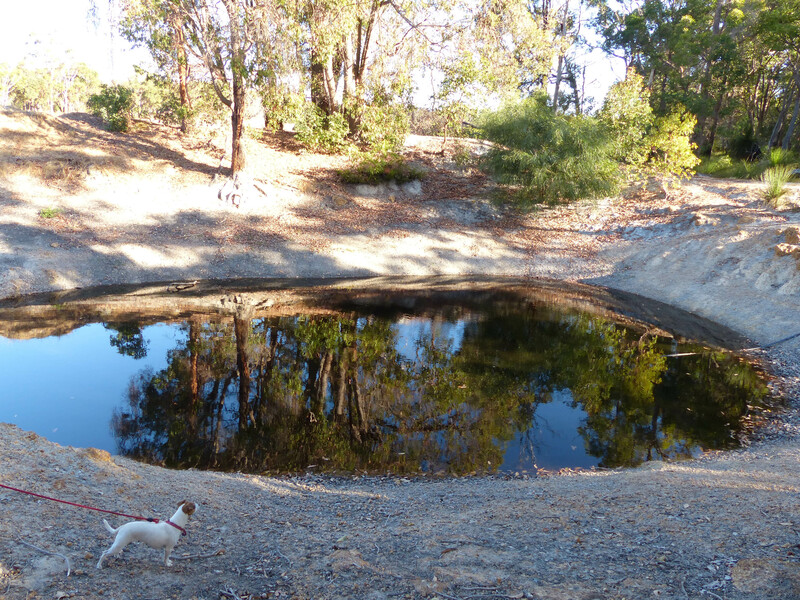 There is a sense of age and mystery about these water holes, for all that they have been man made. My Father divined this (and many others on this farm) using a stick, being guided to find water by the energy of the land, being shown where the underground spring flowed and how deep. Being in tune with the Earth is such a powerful gift. Here at the water’s edge, it is possible to feel the whisper of the spirits and know you are being watched by many eyes, here and beyond. 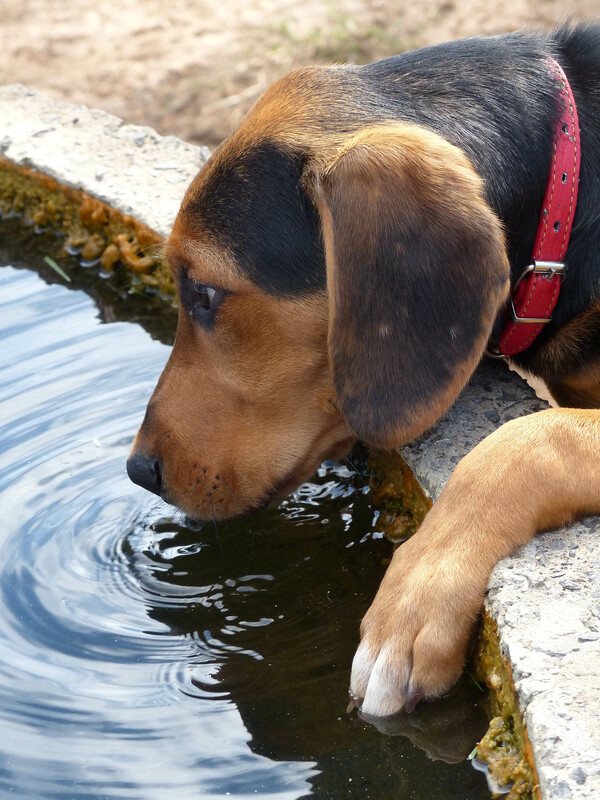 Being respectful of the water that is sacred to all life, becomes second nature when in the presence of such energy. I know the swamp dog comes here to drink, I have always felt his presence at this place. My eyes do not see him, but every nerve in my body tells me he watches. There is a constant aura of the unknown here. His footprints are in the sand, his energy ripples along these pathways. 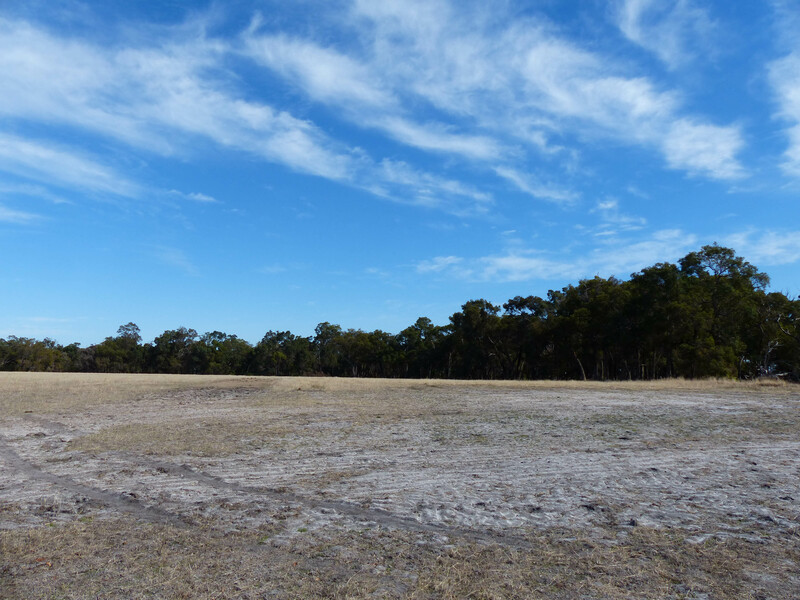 Together with the kangaroos and emus, the foxes and rabbits and birds, he shares this water supply with the less than “native” creatures of the farm, as the water is piped away to tanks and troughs for cattle, dairy and homes. 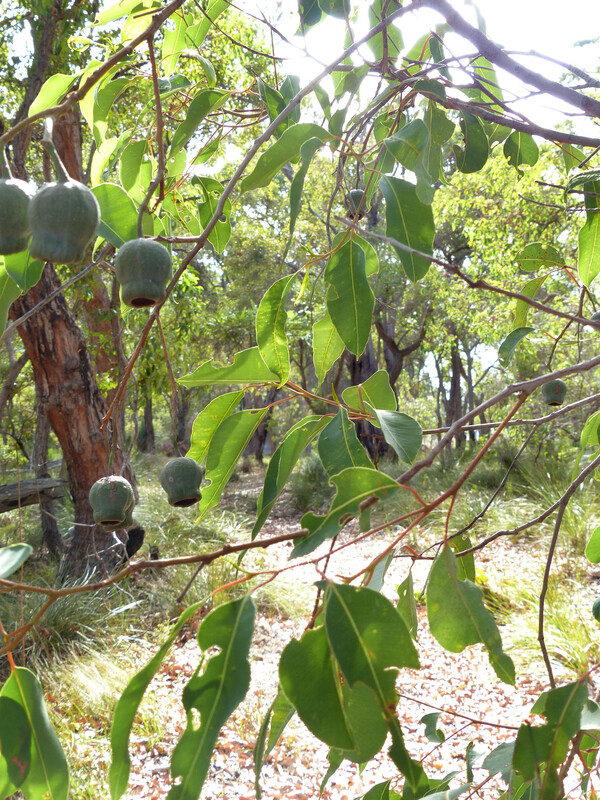 I am always grateful for fresh water, for the Yarragadee that is the life blood of this land…. 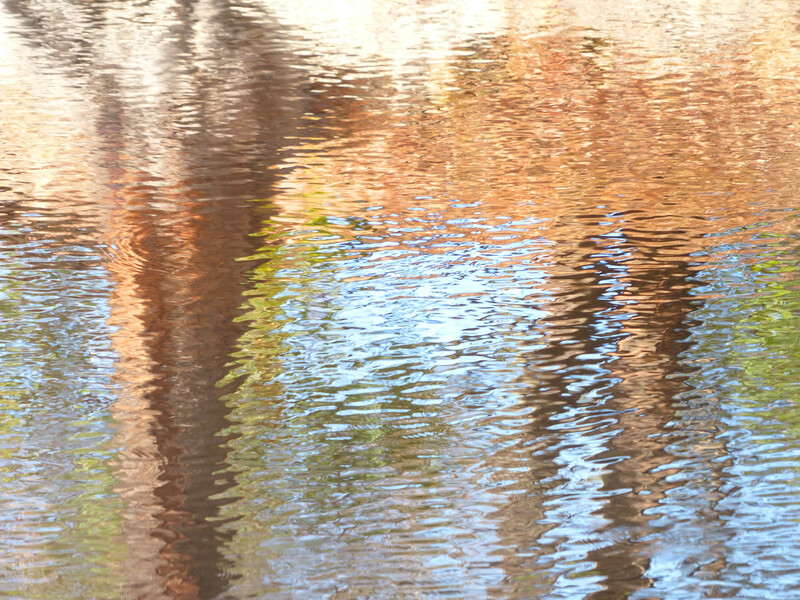 Reflections abound….. 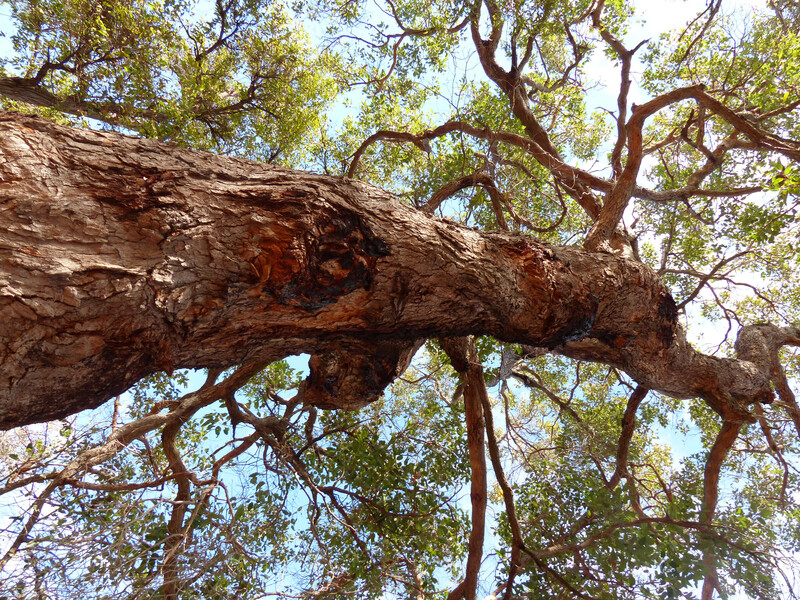 This old tree stood lush and flourishing and unique, a work of art bearing testiomony to the survival and endurance of Mother Nature. Sixteen months ago, it created a whole different display of beauty and art against a night sky and I thought that would be the end of its “life”. 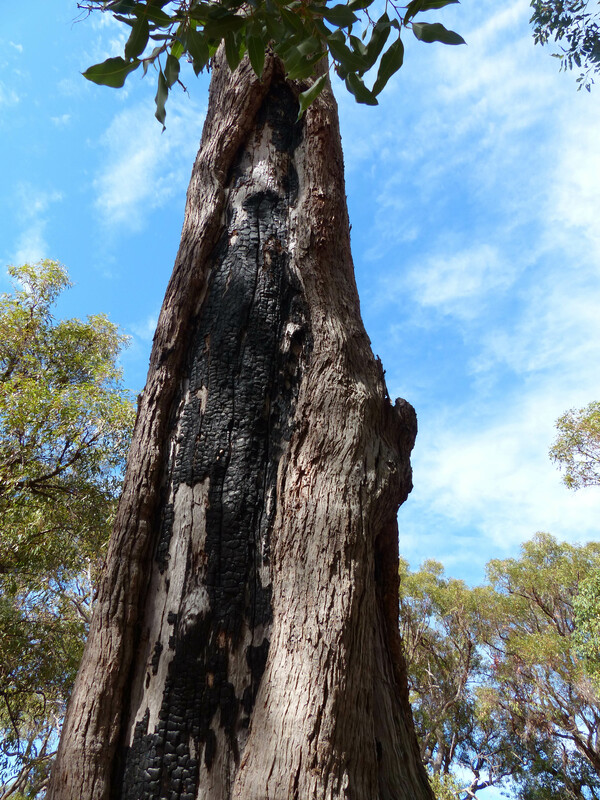 But in true aussie style, it has prevailed to continue writing its story against the sky and the backdrop of the bushland. 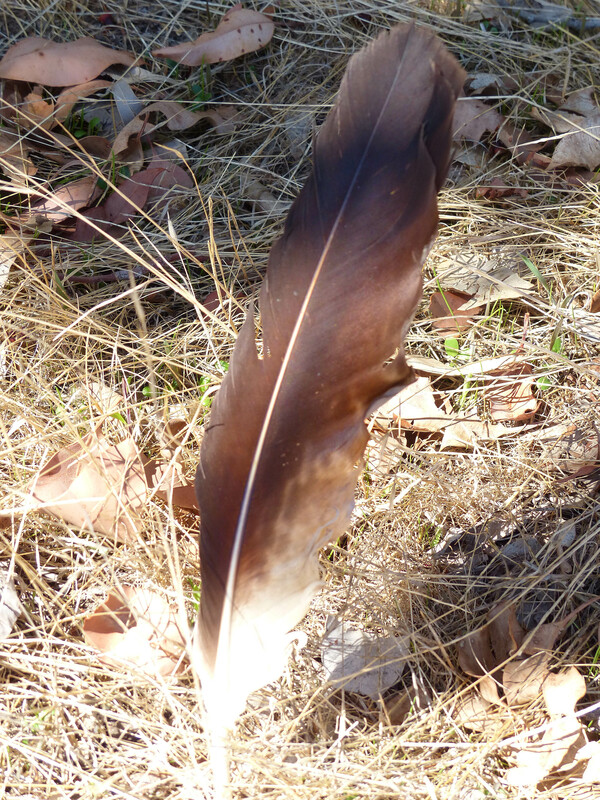 As I walked for home, a feather caught my eye laying on the ground…. a fluffy whispy little messenger blowing in the wind like a flag, against a blade of dry grass. I wondered briefly at what it signified, but smiled, and walked by, quietly acknowledging its intricate beauty. 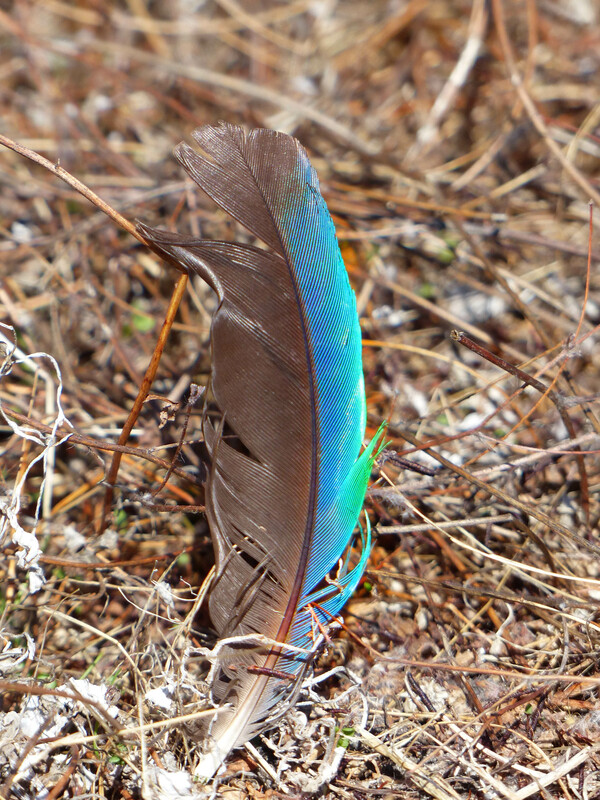 But a few steps further along, a flash of green blue caught my eye and another feather demanded my attention with its colour therapy splash. “That’s two!” I thought as the feathers pointed me in a certain direction….. “I wonder what three will be”…. and sure enough there ahead of me on the ground was an amazing gift. …. a wedgetail Eagle feather! I stood there for a moment feeling really blessed. And walked back along the way I had come to revisit the trail of feathers. 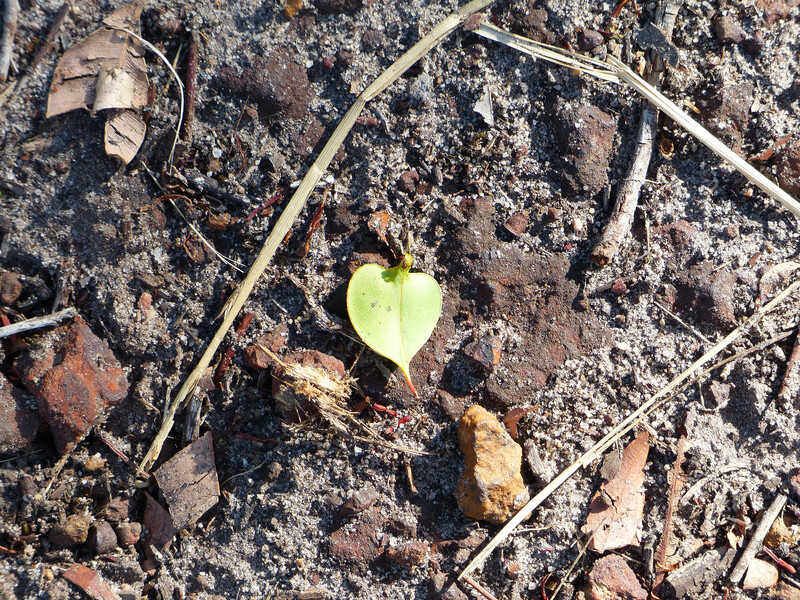 There was something in being called to follow a path however small and seemingly insignificant. As I stood there in the open paddock with the wind blowing gently, the rush of feathers in my mind, there was an eery silence, then loud crashing in the bush where I had been a few minutes earlier. 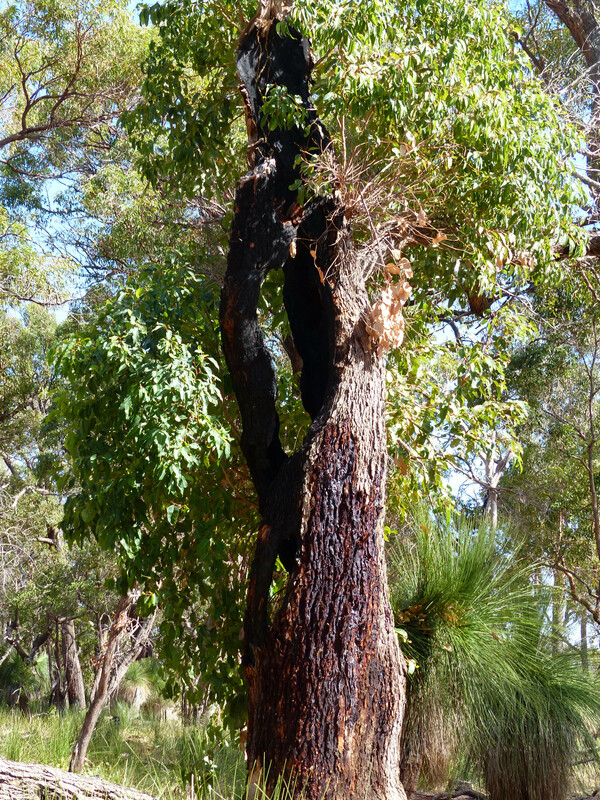 The crashing got louder, it was not the sound of a kangaroo thumping its way through the forest. It sounded like tree branches falling. I felt a prickling sensation again of being watched, and then, there was more crashing. I could not see what was there but I truly felt a presence and decided it was time to go home. I followed the trail of feathers again, this time there seemed to be more, crow feathers, parrot feathers etc… until I picked up the Eagle feather…. it was one of the many gifts of the day and saying “thank you”, I carried that home with me. I wondered if all those years ago, my Grandmother might have walked this same path and marvelled at feathers or tiny transient pieces of natural art but I knew that regardless, there were many before me who had done this and more, and left their footprints across this hillside…. I wondered too, if somewhere in the distant future, another woman might do the same, pausing to sense and reflect upon my own invisible footprints left indelibly behind as stories and memories in this place…..
There’s a secret place inside each of us, hidden from the world, where every time we have a dream or entertain a heartfelt wish, or even feel a ray of hope or desire for that special something in life to kindle the spirit or arouse the heart, it gets stored away. No matter how elusive or intangible, or how quickly our conditioning denies or rejects our secret hopes and dreams, this space inside us saves them to become part of our unwritten story. Most of us are not even aware we do this or where we keep our dreams and wishes locked away. Most have had them buried deep for too long, or darkened and dulled by pain, grief or stress and the tedious nature of our everyday lives. As children we dip in and out of this inner treasure trove, a kaleidoscope of the imagination that our hearts know so well how to turn, yet sadly, by the time we reach adulthood, most of us have forgotten how to access that place or even that we ever had such a library of the soul’s joy. But what if the key was found to unlock that collection of dreams that we have carried forever, and set them free to play? What happens when you open your heart to release all of the dreams you had as a little girl or boy, together with the wishes you have collected along the way into adulthood….the moments that caused your heart to swell, your dreams to awaken, your spirit to rise up and remember? And you paint these dreams and memories with colours and light, and set them free to dance to a drum beat and some music? 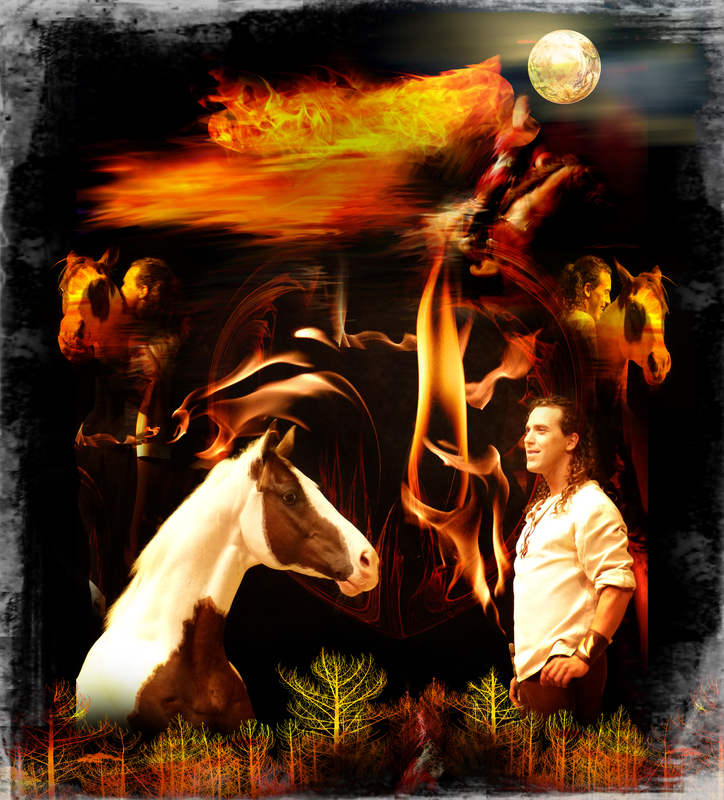 There on that stage – the passion, the dance, the music, the colour, and the very art and magic I inhaled, became the keys to unlock the true joy in every cell of my being – and I exhaled my awakening in the form and grace of Equus. 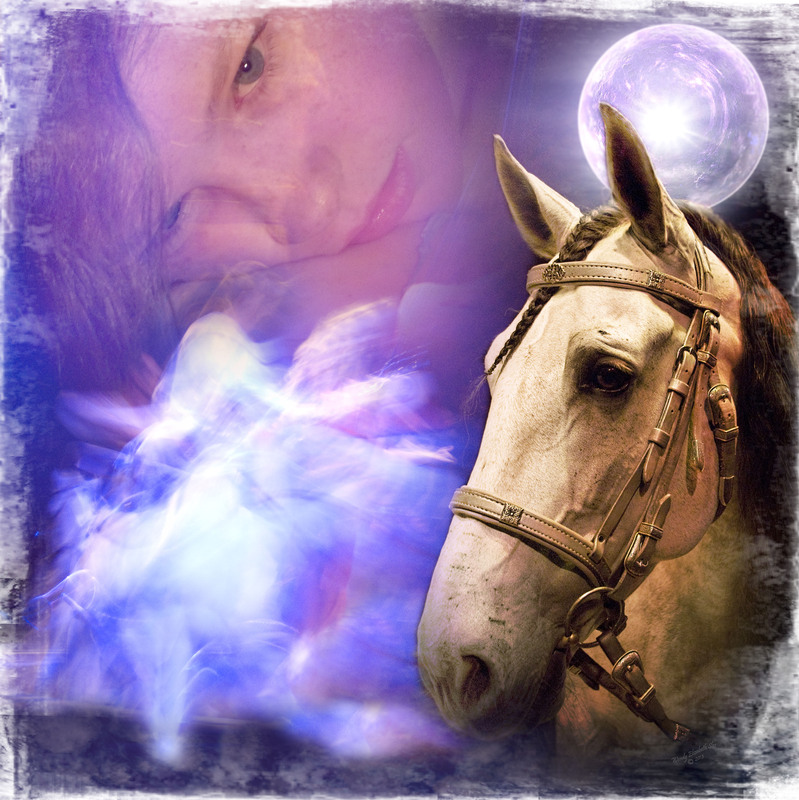 When human hearts and horse hearts express themselves together, there is an alchemy that releases all the collective dreams of the human soul. You cannot remain unmoved, you cannot be untouched when held in the vision of a horse. 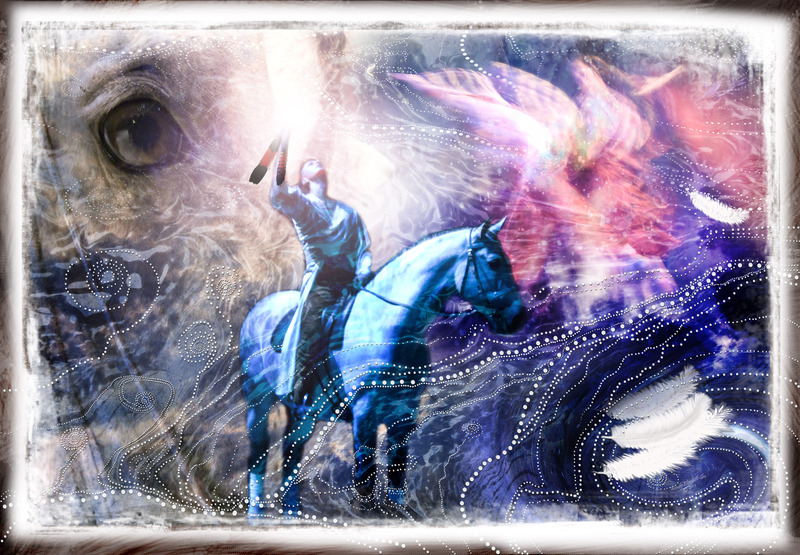 The thunder of hooves, the beat of a drum, the rhythm of awakened heartbeats, weave together the cadence of life’s journey. It was so simple and yet so powerfully effective. As I stepped into the darkness of the tent, my heart quickened. And fell in time with the drums…. And the lights played seductively across the stage and from the shadows the first horse appeared, with his rider…. And the door to my secret collection of every wish or dream I had ever known, blew wide open. So I relinquished the world outside and its cares, and I became all I had ever dreamed …. I stared into a horse’s dark eyes, and became the dream. I am the music, the sweet high notes and the lows, the rise and fall, the longing, the heartsong reverberating in unspoken promises and long forgotten dreams…. I am the tenderness, the connection, the silent language of the spirit that is life’s gift to itself… All this and more – I become, awakened and released from that dream sanctuary within. I am the noble hearts of horses dancing with humans like an ancient rite of passage – and in all this, I reclaim what the unforgiving world has almost stolen from me. 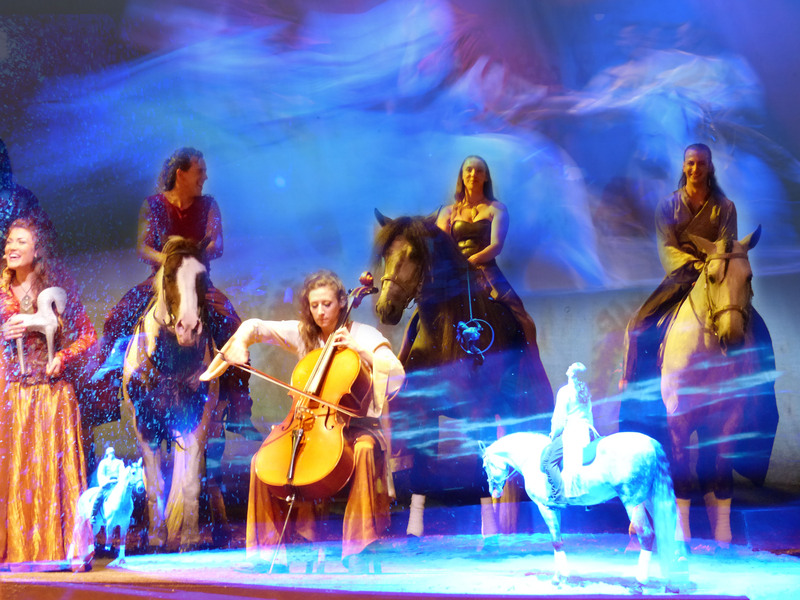 My inner Cavalia is illuminated. 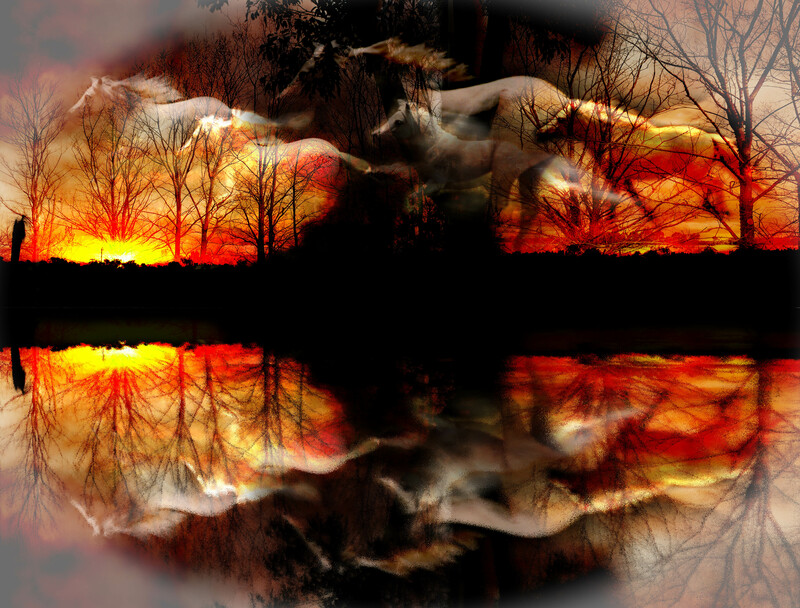 Reflected soul deep in a horse’s eye … I rediscover who I am. As the pink glow of a sunrise touched her from afar. “Hau, Tunkasila Ksapa” her old voice softly said. And she nodded again acknowledging the infinite Star Nations. Where the girl, not yet a woman, came to hear the words she said. The Healer, Teacher and Wise One, who had walked many lives before. Told the girl to place her hand inside, and tell her what she found. ‘But Unci, the basket’s empty’ she said with great concern. But the wise woman simply smiled and said ‘You have much to learn. And our inner eyes and spirit will show us what we must find. Each lesson brings us a knowing, to be carried deep inside. You must place it in your basket and keep it safely there. Listen with your heart’s ears, to the words the Spirit’s speak. You may be a simple woman, but you are never small or weak. The future life of all Tribes flows through a Woman’s veins. For what you keep as medicine – will be what life gives to you. But it carries woman’s wisdom, and the love of Mother’s touch. The medicine she has given me is an honour that I share. There is forgiveness, love and kindness – the tools that serve me well. And giving thanks for every day, each moment, young or old. There is wisdom, and compassion – such magic I have learned. All things that I have gathered, as the wheel of my life turns. And their eyes connected deeply as she gave her admonition. The things that do not serve me – I simply cast away. I choose not to carry anger, regret or bitterness. Forgiveness is a powerful tool that you should not forget. But remember as you journey, YOU choose what to take with you. Your destiny is written in the flow from birth to birth. Seek Great Spirit’s guidance, and you will have eyes to see. A Woman’s Medicine’s unseen – It’s what you keep inside.